Ethical or Socially Responsible investing is all about questioning those that we support through investing in their shares. How we question them depends upon the mandate that you give us. Generally we will apply either positive screening to look for companies that support the environment or society or negative screening to ‘weed out’ companies that don’t act responsibly. Is ethical investing just for large investments? Absolutely not. Many pension and investment providers will offer an ethical fund ‘option’ via their main fund range. Be aware, however, that ethical funds can be a bit more volatile in performance. This can mean that some clients who are relying heavily on their funds – may chose not to invest solely in ethical funds. Can you really be sure that you are only supporting ‘ethical’ stocks? The truth is that – in this globalised world – it is very hard to be absolutely certain that every single investment within a clients portfolio is not linked to something tht is behaving unethically. 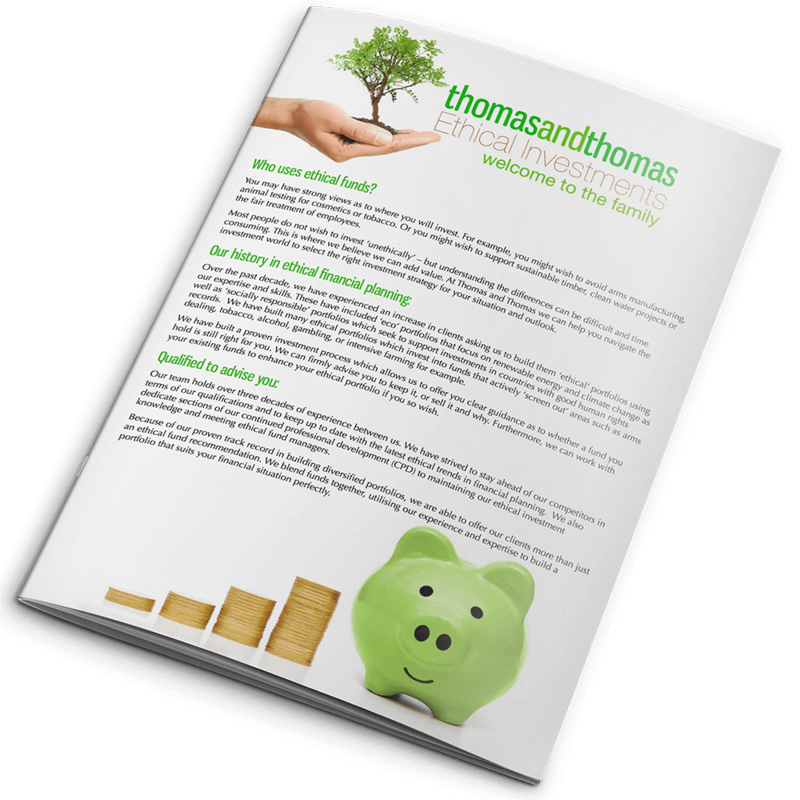 However, at Thomas and Thomas, we go to great lengths to screen the fund managers that we recommend to our clients. Our robust checking process means that we are 100% confident we have picked fund managers who are doing all that they can to meet your ethical criteria. Do ethical funds perform as well as mainstream ones? An ethical fund manager starts with far less stocks that they can include within their fund because they will have applied ethical screening. This means that the fund can be more volatile in certain market conditions and it prevents the manager from being able to make traditionally defensive plays such as holding tobacco and alcohol in a downward market. That said, (in our view) the structure of companies that behave ‘ethically’ offers them a better long term prospect for growth because they are very often ahead of trends and more palletable. Is ethical investing just for environmentalists? Not at all! We have seen an increasing amount of investors demanding ethical screening for their portfolios over the past few years. This is often not so related to their concerns about the planet. It can have more to do with the fact that they don’t want to support investment in companies that abuse their staff or society. Investors are starting to realise that they can really affect change in society through the power of their investment portfolio. If you have a question about our services please get in touch today we would be happy to help.